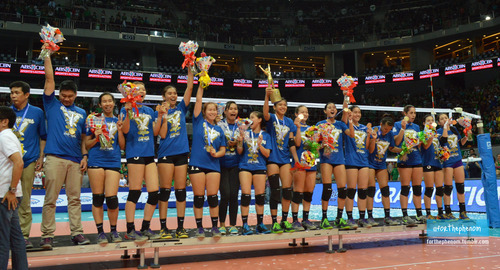 Here are your reigning and defending UAAP Women's Volleyball Champions! The team also bagged Bronze at the recently concluded ASEAN University Games held last December 9-21 at Palembang, South Sumatra, Indonesia. They are the first women's volleyball team to represent UAAP and the Philippines in the said tournament. The thread also doubles as the discussion thread for the Ateneo men's and juniors' volleyball teams. at least nag-improve!! Kunin na ang set 3!!! THA up 2-0 against PHI, 25-14, 25-17! wwaaaah buti pinasok na si Mich and Giz. Mukhang di pa kaya ni Jia maglaro with all her might. Bakit kaya satin lagi ang first point ng bawat set? wow, konting run. sana tuluy-tuloy!